It turns out there is an Australian Face Book group of foodies called Baking Our Blues Away dedicated to helping beat the winter blues by creating an annual day of goodwill. On Monday 15th July 2013, everyone anywhere in the world is encouraged to take a moment and give someone they know or don’t know, be it a loved one, a work colleague or perhaps a stranger on the street, a bit of baked or handmade love. Personally I think this is a fantastic idea!! Come on Herbivores . . . Who wants to bake with me on Monday!?! I had a friend staying with me from Wellington last night so I decided to make something a bit fancy . . . Especially when that friend is following my Herbivore posts and after reading my Day 9 – World Gin Day French 75 post, he shows up on my doorstep with a bottle of very good gin. Houseguests that arrive with a bottle of good gin definitely deserve a special meal. Being from the United States and growing up in South Florida, which has a large Latino population, Mexican food is one of my favorite types of food to make. Although, this recipe I would consider more Modern Mexican, which brings up the question of what is actually the difference between Tex-Mex, traditional Mexican, and Modern Mexican food. Tex-Mex originated with Tejanos, Texans of Mexican descent, as a mix of native Mexican and Spanish foods when Texas was part of New Spain and later Mexico. It became Americanized in the 20th century, when modern American processed foods (like yellow cheese), became cheap and readily available. In the 1960s, Americanized Tex-Mex food became a popular cuisine, characterized by heavy use of shredded cheese, meat (particularly beef and pork), beans, shredded lettuce, fresh chopped tomatoes, big dallops of sour cream, the heavy handed use of chili, and wheat based tortillas. Dishes such as Texas-style chili con carne, chimichangas, burritos, nachos, and fajitas are all Tex-Mex inventions. Alternatively, Mexican food is complex and uses subtle flavor combinations from native ingredients including tomatoes, squashes, beans, avocados, plantains, cocoa, cinnamon, vanilla, tropical fruits, and corn tortillas, as well as other forms of lime treated corn like atole, pozol, tamales, and sopes. Despite the introduction of wheat and rice to Mexico, the basic starch remains corn in almost all areas of the country. Mexican food has a reputation for being spicy, but its seasoning can be better described as strong and flavorful; chili peppers being used for their flavors and not just their heat. Traditional Mexican food has a base of corn, beans, and chili using meat and dairy sparingly concentrating on the dishes other ingredients and flavors. 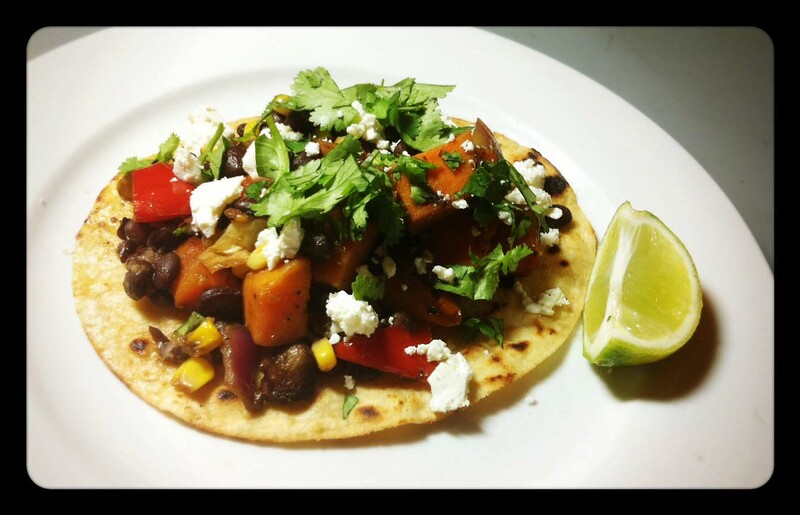 I consider this recipe for Roasted Garlic and Caramelized Vegetable Tostada to be Modern Mexican, as it combines ingredients and a type of dish that is traditional with popular contemporary western flavors like balsamic vinegar and roasted garlic. The original recipe from the How Sweet It Is blog, which typically focuses more on deserts and sweet treats than savory mains, calls for using shredded cheddar cheese and Greek yogurt or sour cream, but I chose to substitute the shredded cheese with cow’s milk feta (which is closer to traditional queso fresco) and leave off the Greek yogurt/sour cream, which I thought would drown out the more subtle flavors. This recipe can easily be made dairy free and Vegan by leaving off the cheese. Line a baking sheet or grease the try with olive oil. In a large bowl, combine sweet potatoes, peppers, onions, corn and mushrooms. Drizzle with 3 tablespoons of olive oil, then sprinkle with salt and pepper and toss to coat. Spread on a baking sheet and roast for 20 minutes. Toss vegetables with the balsamic vinegar, and roast for 15-20 minutes more until caramelized and sweet. While veggies are roasting, heat a skillet over medium-high heat. Brush each tortilla (front and back) with olive oil, then place one at a time in the skillet until crisp and bubbly, being careful they don’t burn. Each tortilla should take about 5 minutes or so. Remove tortillas and place on a wire rack or plate to cool. Return the balsamic roasted veggies back into the bowl, add in the black beans, and mix. Squeeze out the roasted garlic cloves and mix thoroughly into the vegetables. cilantro/corriander, cheese and lime juice.